One thing is for certain, Ali is an organized crafter. Her space is perfect for her needs and even the smallest of items (like her stamps) has a home. For even more fantastic pictures and a detailed description of how the space is used, check out Ali’s office tour on her blog. This space is truly incredible. Thank you, Ali, for sharing your office with us. I really love how she organized her stamps! 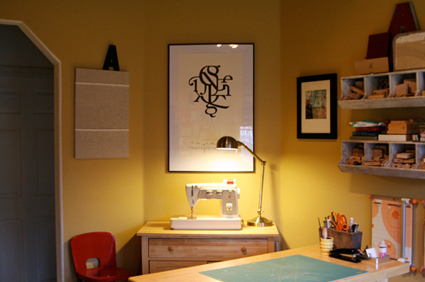 I love that print on the wall above the sewing machine. And the whole room is my idea of neat and tidy! Those two cubby things on the wall… where can I get something like that? I would love two of those in our kitchen to collect some of the items that congregate on our counter during the week. I’m trying to figure out how you get in there. The space seems so narrow. Maybe you are a really small person? I love how organized everything is, and that it looks like someone real works and lives there. So many of these offices featured are very cold to me, this looks warm. Ali Edwards is a scrapbook celebrity. I have seen her previous craft space and they were very cluttered. Organized, but cluttered. Did she really get rid of so much stuff? I can only wish my workspace were as lovely, warm, and organized as this one. I love how she mixed and matched all the old pieces with new things, and the colors. I’ve been eying the Elfa wall systems for my office space for a long time, but have held off on getting one primarily because I felt they look too utilitarian and cold. I had just about convinced myself that I was wrong, when along comes this space to make me realize I do want something more personal and warm. Now I just have to start making it happen. Love this space!! I especially like the lockers and the paper trays – very cool! @savvy – the cubby things on the wall are a type of chicken rooster where the hens lay their eggs. They are very easy to make and plans can be found in most books on raising poultry. We made them for our chicken coop. This space is fantastic. Like DJ, the warmth and personality of the space make it seem like an enjoyable place to be without being cluttered. I really like the use of the wall space and mixing art with utility. My own sewing place is in a loft area with very little wall space. I’ve not yet finished developing the space and really enjoy gleaning ideas from others’ work areas. Thanks Erin, I’ll take a look. Beverly – There is a large gap between the crafting table and the computer table that you can see if you follow the link to her blog. There are also pictures that show lockers on the other side of the room to hold extra supplies. Oh, how I wish I had a room of my own for my crafts! I’m so envious. This work space is beautiful. Maybe when we’re empty nesters, I’ll get a room of my very own. Wow! I just came here from Ali Edward’s blog and was surprised to see her workspace featured on Unclutterer! 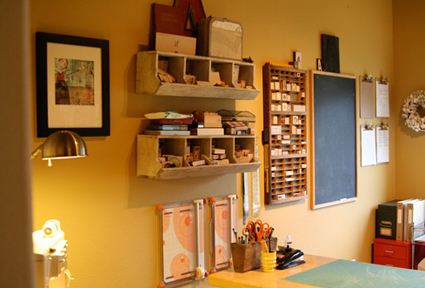 What a cool idea to have a craft room, even if you just do crafts for a hobby like me. Love the photos, everything is so organized, looks like supplies are easy to find. Also, it looks warm and inviting. That room is like my dream come true! I just read your article in Real Simple and it led me to your awesome blog… thanks for the inspiration! Thanks so much for the highlight! And Sharon – I really DID get rid of a lot of stuff :). I’ve seen organized knitting spaces that used shoe cubbies mounted on the wall for storing yarn. A hanging shoe cubby in a closet would work as well. 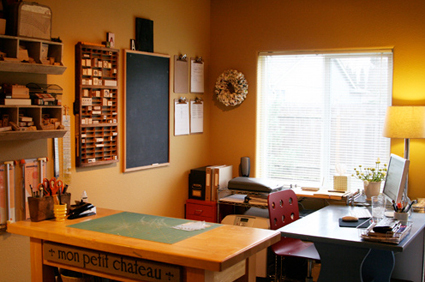 Yay, I love it that this “workspace of the week” is a craft room! I make these spool stands specifically for craft room organization: http://www.karenelizabeth.etsy.com!